Rob Levitt has been one of Chicago’s leading butchers for several years, and his five-year-old store, The Butcher & Larder, has gained an even higher profile since moving a short distance from its tiny original shop to the Local Foods retail store that opened last June. Customer service and information is part of the store’s stock in trade — so it was not surprising when the news broke on Thursday (June 23) that fans voted The Butcher & Larder as Best Butcher Shop in Chicago in an online poll conducted by the Chicago Reader newspaper. The following story is an updated version of one that Good Food on Every Table ran on March 17 prior to Levitt’s ham curing workshop at FamilyFarmed‘s Good Food Festival. 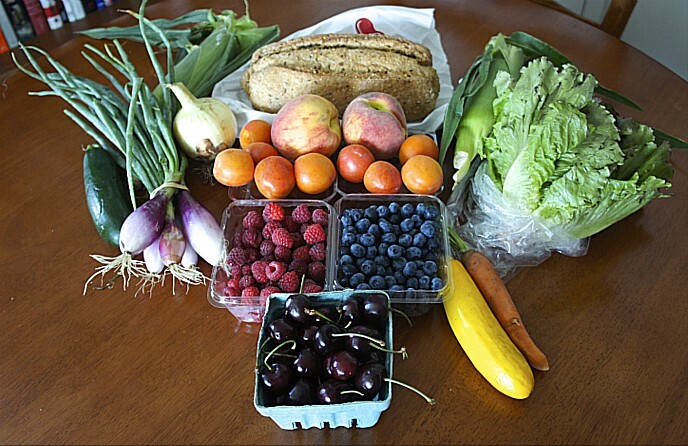 It is also the latest entry in our “Farm to Table: Keeping It Real” series, and follows a column written by one of Levitt’s colleague — chef Abra Berens of Stock the Café at Local Foods — about the urgency of reducing food waste. If you are in the Chicago area Saturday, you can meet Levitt, Berens, and others on the Local Foods/Butcher & Larder team at the store’s 1st anniversary celebration. Admission is free, but an RSVP is requested (click here to register); great food and beverages will be available for purchase. And click here to read more about Local Foods and its grand opening on June 30, 2015. 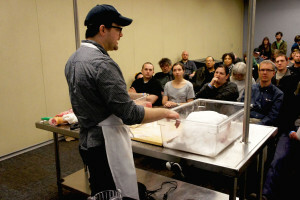 When Rob Levitt, one of Chicago’s leading butchers, conducted a ham-curing workshop at FamilyFarmed’s Good Food Festival on March 26, it made sense, and not just because the event was on the weekend of Easter — a holiday on which ham is one of the traditional dishes. 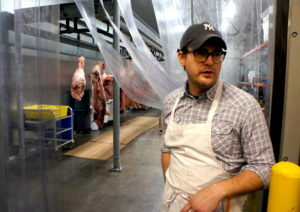 For one thing, Levitt — founder and head butcher at Chicago’s The Butcher & Larder store — loves ham. “Cured ham is my favorite thing in the world,” said Levitt in an interview, adding that for his first Father’s Day, his wife Allie (a talented chef with whom he worked in restaurants before they started the store in 2011) gave him an aged Benton’s country ham and a custom-designed ham-cutting knife. And curing ham is something Levitt and his team of young butchers get to do a lot more since last June, when they joined forces with Local Foods — a distributor of locally and sustainably produced fresh and packaged food products — in a new retail market located at 1427 N. Willow St. in Chicago’s Bucktown neighborhood. The Butcher & Larder’s original shop, about a mile south in the Noble Square community, was tiny. Its location at Local Foods thus was like a dream come true for Levitt and his team, providing them with ample space to prep the whole carcasses they receive from sustainable and mostly regional producers (the cutting tables in the original store were right in the middle of the shop); rooms where aging or cured meats are hung; and a smokehouse all their own. The new facilities have enabled The Butcher & Larder to provide greater availability of one of its customers’ favorite items: boneless city ham, which is brined, smoked and usually custom-sliced as cold cuts. This is an item that was available, but less often, at the original store. “It’s just been flying off the shelves” at the new store, he said. Levitt’s emphasis on obtaining locally, sustainably produced, pasture-raised meat for his store pre-dates The Butcher & Larder. He is a chef, trained at the Culinary Institute of America in Hyde Park, and even opened and ran his own restaurant, called mado, with his wife in the city’s Wicker Park neighborhood before they shifted their focus to the butcher shop. His zeal for merging farm to table with a whole animal “snout to tail” butchering practice made him at apt partner for Local Foods, a distributor of locally and sustainably produced Midwestern products, when it was developing the retail store. 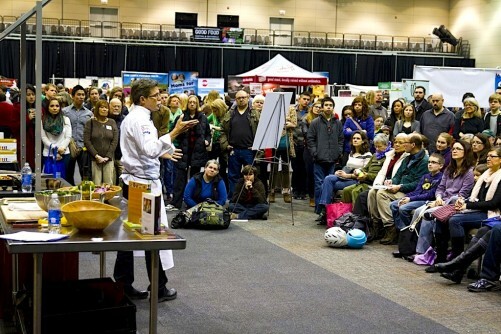 There also is a good reason why Levitt was a great choice to do a workshop at the Good Food Festival for the second consecutive year (he conducted a class on pâté making at the 2015 event). Levitt has always put customer service and information first. Since The Butcher & Larder is a whole animal shop, it is trying to sell every cut of meat, from the high-end “restaurant” cuts such as ribeyes and New York strip and crown roast of pork and rack of lamb to the least expensive cuts that are best when slowly braised. And Levitt and his staff excel at informing customers about some of the cuts that are less familiar and less expensive, but nonetheless delicious. They also will provide tips for cooking these cuts and — in a luxury they didn’t have at the original, meat-only store — can point customers to produce and other items in the Local Foods store that would go well with the meat. Because of the high quality of the meats The Butcher & Larder sells, and the custom cutting and other services it provides, even its lower end cuts aren’t exactly cheap. 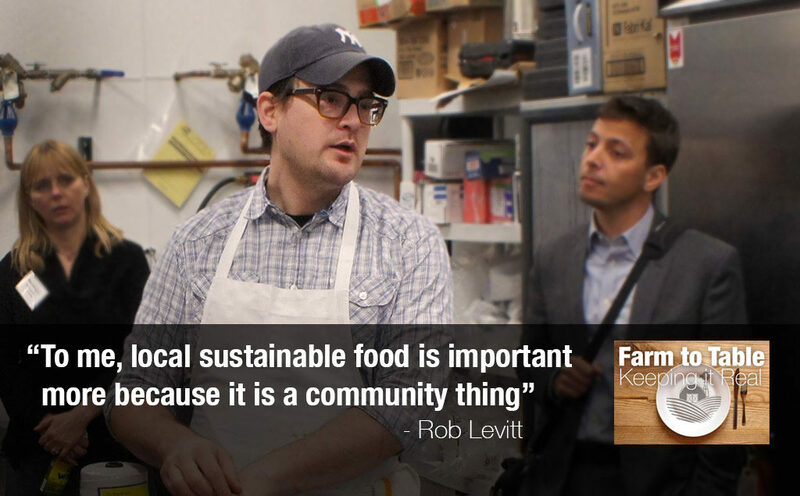 But the store reflects a mantra of the Good Food movement: eat better meat, and less of it. “We always encourage people to get smaller portions. It’s weird, I’m the only butcher I know who encourages people to buy less. Because I know they’ll be satisfied, and people feel I’m not trying to rip them off,” Levitt said. That ethos extends right down to the humble hamburger. Levitt believes that when all the cuts are high quality and have great beef flavor, the specific cuts that go into the grind matter less than having a high enough fat content to enhance the flavor and the texture of the cooked burger. He said some people come in and insist on ground meat from expensive cuts, and he tells them they would be happy to, but it would run them around $15 or so a pound. The house blend, which makes a delicious burger, runs around half that price. 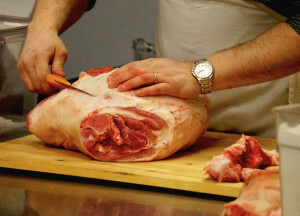 Along with the everyday information sharing at the shop, The Butcher & Larder conducts occasional meat-cutting workshops. It is clear that Levitt has found the career that suits him. In a 45-minute interview about his business, he used the word “fun” 10 times. This entry was posted in Beef, Butchering, Farm to table dining, Farm to Table: Keeping It Real, Food Artisans, Food Entrepreneurs, Good Food Dining, Good Food Festivals, Good Food marketing, Good Meat, Grass-fed beef, Local Food, Meat, Poultry, Regional food systems, Sustainable food cooking and tagged butcher shops, butchers, Family Farmed, Good Food Festival, Good Food Festival & Conference, Good Meat, Grass-fed meat, Local Foods Chicago, Local meat, Pasture-raised meat, Rob Levitt, The Butcher & Larder. Bookmark the permalink. I’ve been a long time admirer of Rob Levitt and his team’s work. The Butcher & Larder is the best butcher shop that I can think of off the top of my head.